Not many games have impacted me as much as Hotline Miami has. It was an eye-opener of what video games signified to me and what they could provide. Hotline Miami introduced me to the dedication put into indie video games, a whole new genre of music I never knew I enjoyed, and countless hours of entertainment. 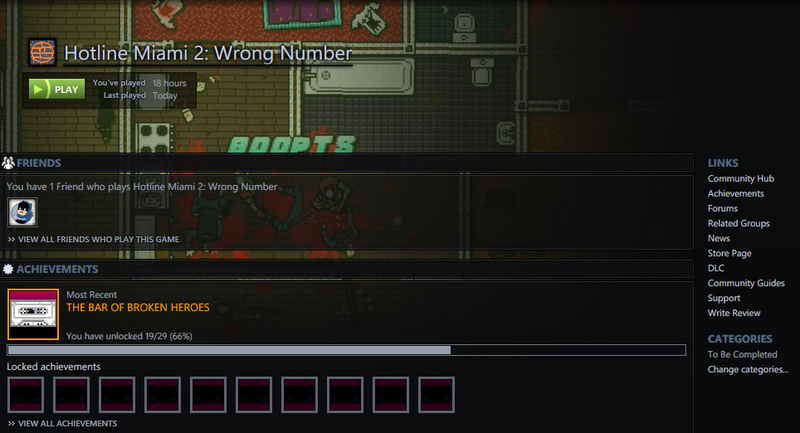 So it would be a given that I had high expectations for its sequel, Hotline Miami 2: Wrong Number. And fortunately, Wrong Number exceeded my expectations, and more. This is a screenshot from my Steam library. For background information, I finished Hotline Miami with all of its achievements unlocked at a whopping 35 hours, given that it was only at maximum a 3-4 hour run the first time through. Yet, I’ve spent 6 hours the first time through Wrong Number, and am barely scratching the surface for completely finishing it. It is not only longer, but also more substantial. The levels are more expansive, the music more unique (when I thought the original’s couldn’t be topped), and the gameplay more exciting. Despite my gushing though, there are definitely areas where the original overshadows Wrong Number. Many times the gameplay can be more frustrating than the original. Since the levels are grander, enemies offscreen will easily cause your demise without you having time to react. In a game which rewards careful timing and preparation as well as quick execution and efficiency, this is a glaring issue. Also, many of the enemies can be bugged, causing frustrating, unnecessary deaths, leading to the grand levels feeling drawn out. Yet, despite these problems with Wrong Number, it manages in achieving what I wanted from a sequel to Hotline Miami: more of the same, but better. It’s great to see Wrong Number do something right.